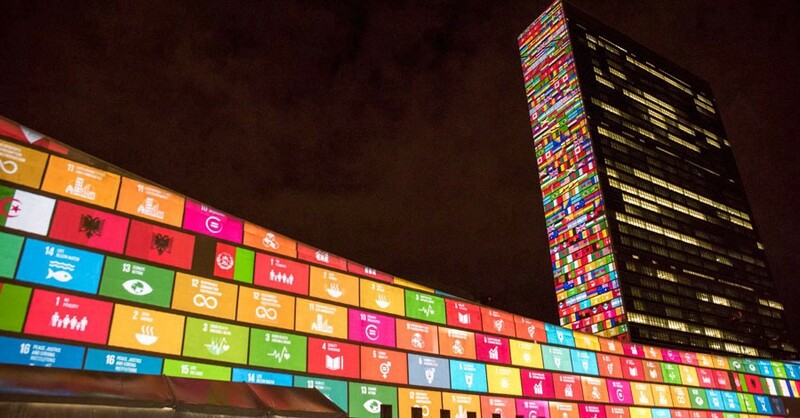 In September 2015, world leaders came together at the United Nations to adopt 17 Sustainable Development Goals. 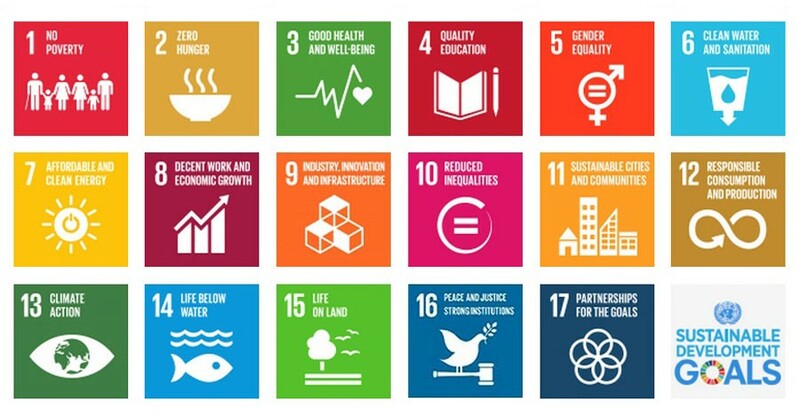 The SDGs — or global goals — set measurable, concrete targets for all nations to achieve by 2030. They symbolize a new beat of optimism: a belief in human possibility to chart a course to actually end poverty, hunger, gender inequality, environmental degradation,conflict, and corruption. They’re big goals, to say the least. On the eve of the goals’ adoption, Bono made a thoughtful case to “think big, act audaciously, [and] get it right.” Despite his sunglasses and rock star status, he is no starry-eyed idealist. While he expressed high hopes, he also wrote about his concern that these ambitions could remain little more than lofty rhetoric. With the globe experiencing the worst period of forced displacement since World War II — a topic on which Bono testified to the U.S. Senate last week — advancing the goals is even more important. Sixty million refugees and internally displaced persons are experiencing the impact of lack of progress on the goals, particularly related to peace, justice, and strong institutions (Goal 16), education and economic opportunity. Taking stock six months since adoption of the goals, it’s clear the path to success won’t be one of a typical international agreement or development initiative. Serious progress will require politicians, policy makers and experts to get out of their comfort zones, and embrace a new formula to mobilize action and investment by many different actors. And real-time data combined with compelling design can be the starting point, revealing where action is most needed and empowering a new generation of what Bono calls “factivists” — people motivated to use data to change the world– to keep us all accountable for results. The 17 goals agreed to in September did not emerge out of nowhere. Built on the Millennium Development Goals adopted in 2000, the new goals reflect what we learned, where we still need to make progress, and the new challenges we face. As depicted above, they are distinguished by their applicability to all countries (universality), their focus on the integrated nature of social,economic and environmental challenges, and the recognition of the need for investments by the public and private sectors. In lower income countries, achieving the goals — and the kind of infrastructure, innovation, and growth needed for their success — will require all types of investors to work hand in hand. 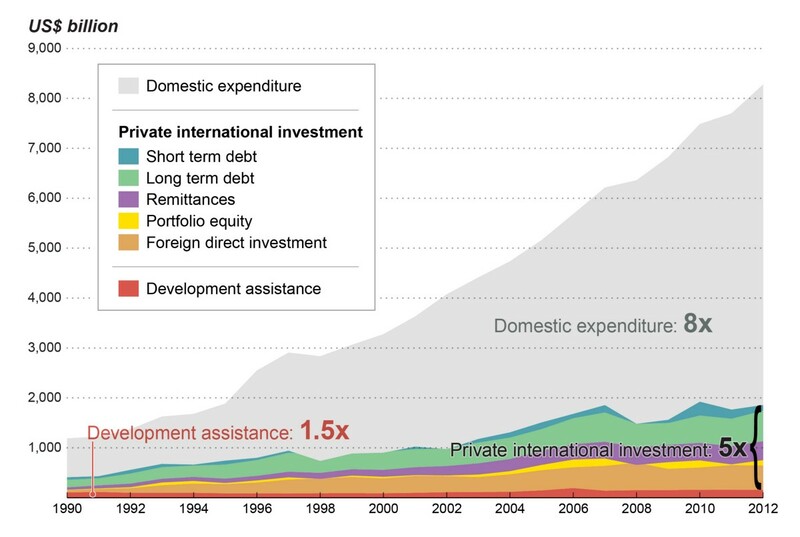 Investment by domestic governments and the private sector, both of which have grown rapidly over the last 20 years, can be combined with catalytic international development assistance. Source: Development Initiatives; ODA and OOFs (OECD); FDI (UNCTAD); portfolio equity and remittances (World Bank); loans data (World Bank’s International Debt Statistics); government expenditure (IMF). Here’s what’s really different from 2000: the data and tools available, and the range of actors who will deploy them to tackle our global challenges. Consider the potential for mobile and geospatial data to create granular and nearly real-time information to act upon. For instance, Global Forest Watch, an effort launched by the World Resources Institute, Google Earth, and others, combines crowd-sourced and satellite data to help communities and governments track deforestation as it occurs. In other words, it’s now possible to collect evidence of, and then take action against, illegal logging before a forest disappears. And getting the basic statistics right is equally critical. Only with data on birth registrations — which are missing for more than 60% of children in some regions — can we keep the promise of our leaders to “leave no one behind” in this agenda. In the age of the smartphone, this also means citizens and leaders can be mobilized and activated like never before, whether that’s through social media or new organizing platforms. The mantra “Tell Everyone,” championed by ONE, Project Everyone, Global Citizen and others, infused the launch of the goals. Social media feeds, televisions and radios lit up with visuals of the goals, and messages of support poured in from a group as diverse as Malala Yousafzai, Pope Francis, Stephen Hawking and Beyoncé. In the week following the goals’ adoption, carefully crafted iconography built a global brand with unprecedented speed, taking the goals beyond the halls of the United Nations and across the world. Six months in, are “factivists” of all stripes — journalists, government officials or committed citizens — using data to drive decisions? Are they communicating the challenges? And most importantly, are we on (the less conventional) path to success? While much remains to be done, there are signs of progress. If beautiful design, social media presence, and star power are bringing awareness to the goals, the targets and data that underpin the goals are starting to create a roadmap from awareness to action. Today, you’ll find the goals’ design reflected in city planning in places as disparate as New York and Johannesburg. Companies, such as Accenture, are using data to make a compelling business case for why the goals are relevant to the private sector. Foundations, business and the United Nations have launched portals to enable their members to learn about the goals, and spur and track action. Experts across the globe are already finding new ways to fill data gaps and provide novel analysis on poverty, gender and food security. The next step, of course, is to build out data for all of the goals. Here, an important milestone has already been reached. On March 11, the UN Statistical Commission reached agreement on an initial set of nearly 250 indicators — a common fact base, if you will — that statisticians in 193 countries will now use to measure their progress. But if we are serious about using data for action and monitoring down to the community level, we must also reach for new tools. This is why the U.S. government was a founding partner of the Global Partnership for Sustainable Development Data, launched in September. The Partnership now has more than 100 entities — companies, non-profits and governments — committed to generating, using and opening up data for the achievement of the goals. This partnership will help build a set of empowered factivists across the globe with access to meaningful and accurate data. The U.S. will also continue our commitment to the goals across the board — whether they’re a basis for dialogue with counterparts in other governments, companies, civil society organizations or the broader public. We’ll be embedding the goals in our diplomacy and communications, using data on the goals to inform decision-making, and reaching out to diverse partners to take collective action and achieve results. After all, the goals are a starting point for a conversation that’s not about “your” priorities versus “mine” — but “our” priorities. 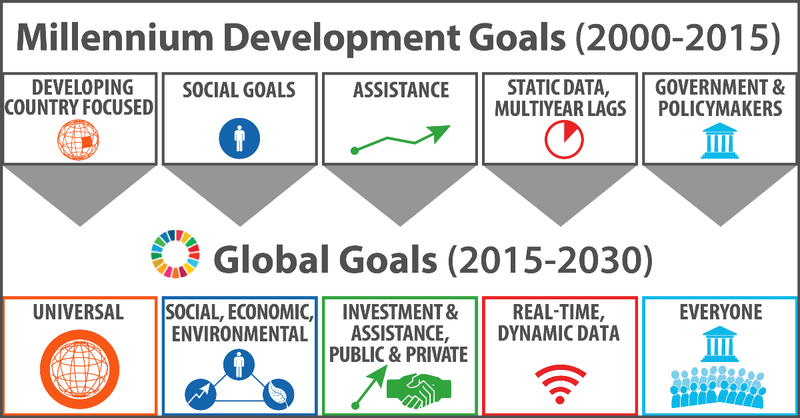 It’s clear that achieving the goals by 2030 will require serious focus, action and investment in the years ahead. Data, design and the factivists they enable are not enough to guarantee success. But they can provide the foundation for action by a citizen, a school, a company, a city, or even an entire nation, setting a common vision for success. They could even help address urgent challenges: for example, providing real-time data on the conditions of refugees and internally displaced populations. Bono inspires us to believe in the power of human ingenuity to achieve the new Sustainable Development Goals. It’s fitting that for a new type of global agreement, it would take a more unconventional collaboration of data geeks, rock stars, policy makers, business executives, advocates, and designers to turn that belief into reality. Previous Post Harvard MBAs biggest opportunity for career impact? Giving their money away.